Before Blue Apron came into the picture, my Sundays…um…sucked. My options were either to spend the day meal planning for the week: pulling up recipes, list making, grocery shopping, then prepping anything I could ahead of time to make the rest of the week easier. My other option was to do what I really wanted to do (anything but go grocery shopping) and pay for it in more ways than one the rest of the week. Either way, it was lose-lose. Shopping wisely meant spending time figuring out what was on sale and where, so I could save money. Saving time meant fun-filled Sundays, followed by wasting money the rest of the week eating overpriced takeout, or buying ingredients that I didn’t use wisely (recipe calls for ¼ cup of cilantro? Where can you go to buy only a ¼ cup’s worth of fresh cilantro?). Time and money were my most precious resources and I was wasting too much of both either way. Enough was enough. My sister-in-law raved about Blue Apron and how, more than anything, she just loved the freedom she had in not having to figure out what’s for dinner anymore. I dismissed it for a few months; my biggest roadblock for not trying it sooner was assuming that it’d cost too much. She brought up a particularly yummy Blue Apron meal she’d cooked the other day, and I finally was convinced I needed to try it out. I was pleasantly surprised; the family plan is $69.92 for 2 meals that each feed a family of 4. It broke down to $8.74 per serving—way more budget friendly that I’d assumed. I took advantage of their first two meals free offer and for the first Sunday in a long time DIDN’T go grocery shopping. The Blue Apron box full of ingredients was delivered to my doorstep at the beginning of the week. I wasn’t there at the time, but when I got home and opened the box, everything was nice and cold, packed on ice packs. Ingredients for two meals were clearly labeled and individually packaged, and recipe cards were included to make two complete family dinners. The recipe cards clearly include calories, cooking time, and step-by-step instructions (with photos). The meals were Swedish-Style Turkey Meatballs with Egg Noodles & Lingonberry Jam, and Almond-Crusted Cod with Coconut Rice & Ginger Spinach. The box included ONLY what we needed and nothing more—no more throwing out brown, slimy, forgotten cilantro left in the back of our veggie crisper. I typically get home around 7 PM, so the true test is getting dinners on the table quickly. We went for the Swedish-Style Meatballs first. Blue Apron noted the cook time 25 to 35 minutes, but I kept track of my own timing (I’ve gotten tricked one too many times into a “30 minute meal” that’s taken 2 hours). 7:15 PM Ingredients were washed, dried, and chopped. 36 minutes from fridge to table. Not bad. My meal prep went and cooking time went from hours to minutes, and I felt good about not feeding the fam another round of overpriced take out. Sundays are allllll mine again. 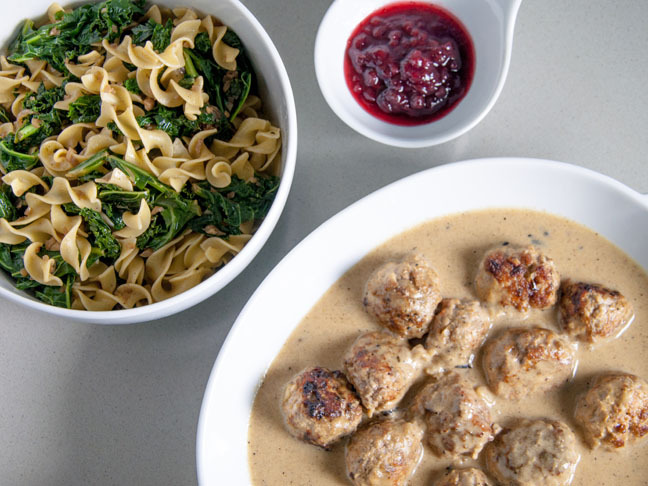 Reclaim your Sunday too: Blue Apron’s giving away your first 2 meals for free via this link.